Becoming a digital nomad is not as easy as quitting your job, booking a plane ticket to the other side of the world, and trying to find some freelance work. It is about making sacrifices, working hard and having the determination to follow your dream and design your own desired lifestyle. In this post I’ll share with you the five things you need to become a successful digital nomad that in turn will give you ultimate freedom to travel the world indefinitely. After reading The 4-Hour Workweek I started questioning the norm and decided to design my work around my lifestyle instead of my lifestyle around my work. I decided to avoid the corporate world by starting my own business and owning my own time. As a digital nomad you’ll need to be able to challenge the status quo and go against the norm. You’ll have to get comfortable with feeling uncomfortable, have the courage to embrace change and challenges, and see opportunities instead of problems. After finishing my studies in Cape Town, I spent a year traveling and working in Australia. During this year I secured my first client and revamped their website remotely. Since then I’ve been building up a client base that has allowed me to work from anywhere in the world. Today I sell online marketing services through my business Posmay Media and have co-founded Freemadic. Charging for services that I deliver remotely has allowed me to earn location independent income. 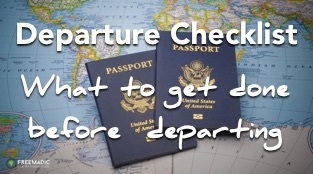 Without sufficient income or savings, you won’t be able to travel for very long. Being able to earn income from anywhere is the lifeblood of a digital nomad lifestyle. In order to do your work and stay in touch with friends, family and clients, you will need a reliable and compact mobile office setup, which should include hardware, software and online services. Depending on your work, this may be as little as your laptop and mobile phone, however it could also include cameras, batteries and external hard drives. Check out our complete mobile office setup to see what we use and recommend. In order to stay connected with your work commitments you will require a reliable Internet connection. The speed requirements and the duration of connectivity will depend on your work, but all digital nomads regularly need an Internet connection. While travelling I always make sure that the accommodation I choose includes fast, reliable and uncapped Internet. I also make sure to get a local sim card for my iPhone so I have mobile Internet access. Various countries like Thailand and Vietnam offer unlimited mobile data for a fixed price. For emergencies this let’s me tether my Macbook to my iPhone when there is no Internet available. To avoid distractions and get the necessary work done, you will need discipline. Having the discipline to maintain a structured and balanced work/life routine is essential. On a trip to Southeast Asia this was something I really struggled with for quite some time. 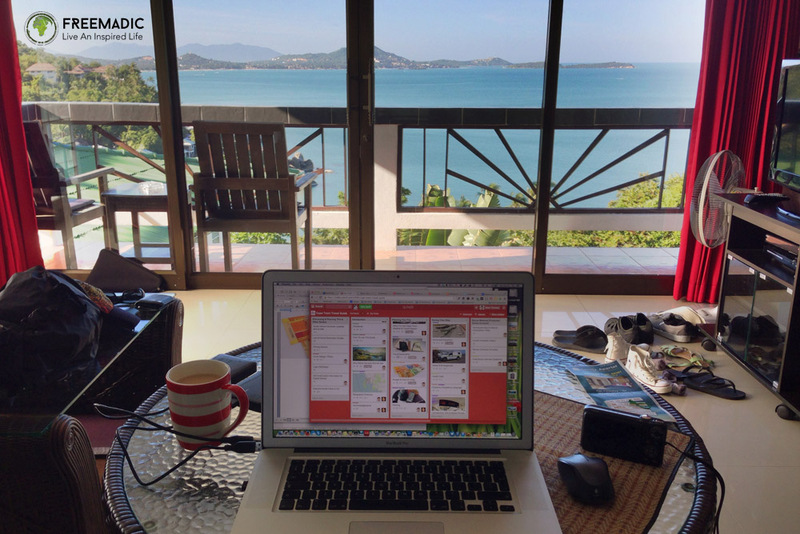 Overlooking the ocean and the two pools on Koh Samui from our apartment’s balcony made it very difficult to focus on work. I did eventually realise that taking too much time off was unsustainable which helped me get back to work and implement more structure and discipline. Have I forgotten something important or do you have something to add or ask? Where was that picture taken, Sean?